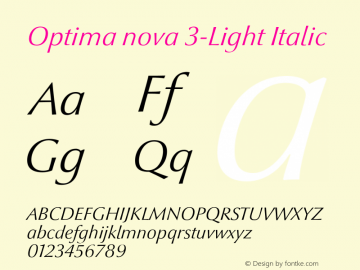 Optima nova 3-Light font family series mainly provide Italic,Regular and other font styles. 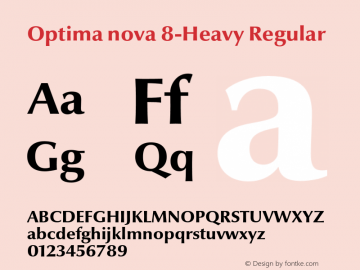 Optima nova 8-Heavy font family series mainly provide Italic,Regular and other font styles. Optima nova 9-Black font family series mainly provide Italic,Regular and other font styles. Optima nova 4-Book font family series mainly provide Italic,Regular and other font styles. Optima nova 5-Medium font family series mainly provide Regular,Italic and other font styles. Optima nova 6-Demi font family series mainly provide Regular,Italic and other font styles. Optima nova 7-Bold font family series mainly provide Italic,Regular and other font styles. 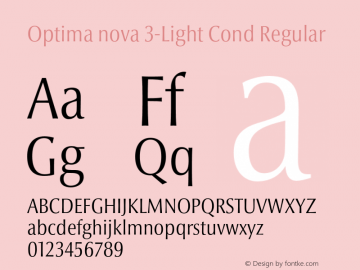 Optima nova 3-Light Cond font family series mainly provide Regular and other font styles. Optima nova 4-Book Cond font family series mainly provide Regular and other font styles. Optima nova 5-Medium Cond font family series mainly provide Regular and other font styles.